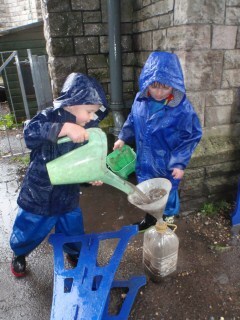 We go out every day, whatever the weather! To ensure that this is an enjoyable experience for your child, please provide them with a warm waterproof coat or lightweight, showerproof coat, hat and gloves (mittens are best) for when it gets cold. A pair of wellies will need to be left at Pre-School in their named boot rack in the cloakroom.